The crew will pick you up at the airport and after a 20-min taxi ride, you will board Lamima anchored in front of the beautiful Amanpuri resort. 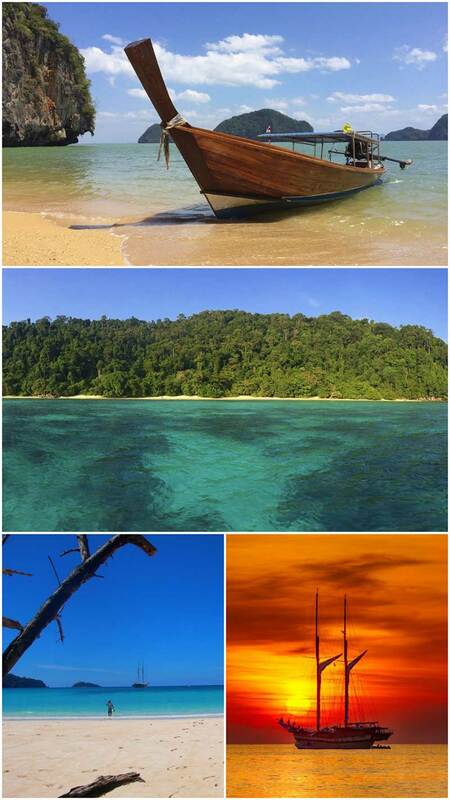 Watersport in the afternoon, and then cruise overnight to Koh Rok Islands. The islands are surrounded by emerald green water, with normal visibility exceeding 30 meters. Just of the shore, you will find beautiful soft corals and numerous different species of tropical fish. Lunch or dinner on one of the unspoiled and pristine white sandy beaches. Beautiful beach, a great diving perfect place for water sport. Island with wonderful west-facing beaches that offer magical sunsets. A recent 5-star resort offers a perfect area where nature has been allowed to blossom, with original trees left intact throughout the resort. On one of the finest beaches on Koh Lanta, they created Pimalai Resort, small heaven on earth with a very nice restaurant for a meal ashore. Enjoy early morning and sunset on the famous beach. During the day Lamima will reposition to secluded areas of the island to explore coves by Paddleboard and canoes. Surrounded by white sand beaches, you can Paddleboard through the turquoise waters to get up close to the limestone formations. Walk along the cliff tops for wonderful panoramic views and a chance to abseil down to your cocktail and barbeque on the beach. Early morning cruise to Phang Nga Bay for the last dip in the water before a farewell from the Lamima Crew and disembarking at Yacht Haven Marina.